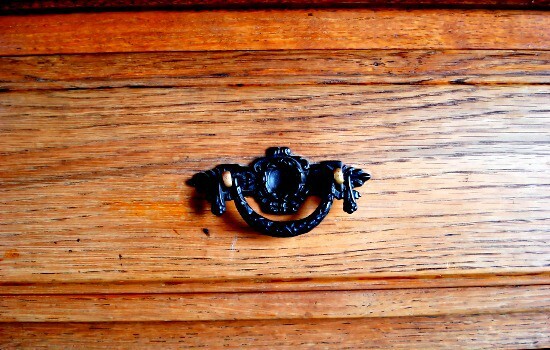 At a reader’s request, I’m sharing my tips on how to fix scratches on wood furniture. By “fix” I mean without sanding, without scraping, and without using those awful smelling chemical stripping solutions. Is it what a professional furniture restorer would do? No, but you also won’t have to pay one. It’s what a frugal homemaker does, and it works well enough that I haven’t had to take my furniture to a restorer yet. As someone who hates the process of sanding and staining or painting furniture, I spent years thinking I’d just have to live with banged-up furniture thanks to my rambunctious kids and pets. I like a “shabby chic” item or two in my home, but by the time my youngest was four all of our furniture had a distressed look, and so did our bank account. Since buying new furniture was not an option, and I had neither the time nor energy to refinish everything myself, I started researching how to fix scratches in wood furniture easily, quickly, and inexpensively. 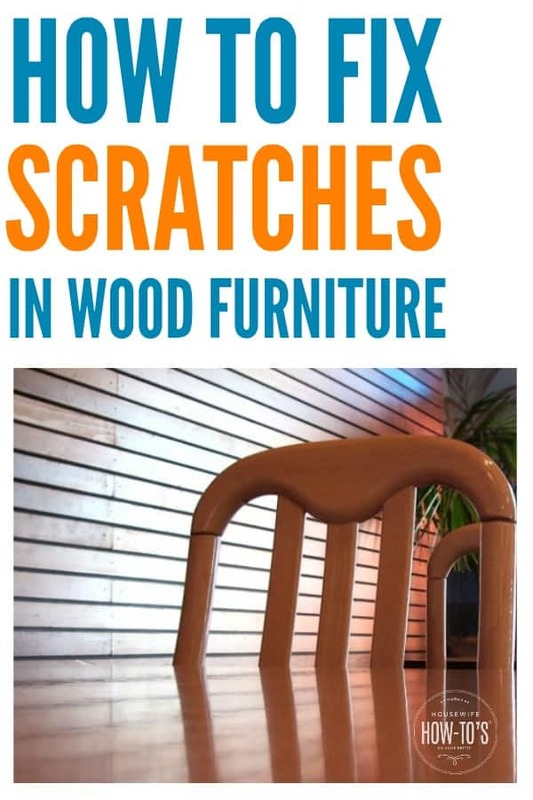 Today I’m going to share with you what I’ve learned about how to fix scratches on wood furniture and have been using to keep mine looking great. Are You Sure It’s Scratched? 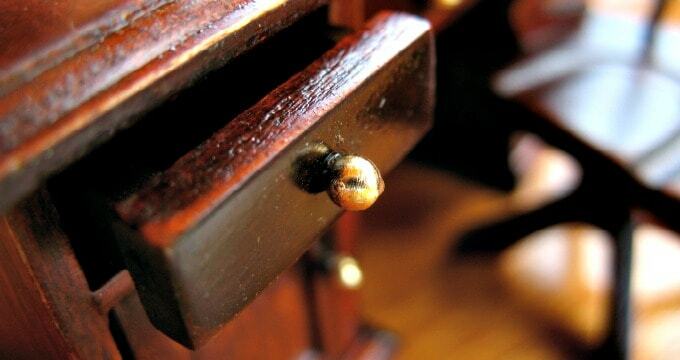 Many times, what looks like scratches on wood are simply scratches in the wax buildup. That was the case with an old dresser I bought: the previous owners had diligently waxed it yearly, and the antique store had used a commercial furniture spray to spiff it up before sale. I pointed out the scratch to get 25% off, then came home and removed all of those layers to reveal perfectly smooth wood. If you suspect this might be the case, or if you’re dealing with buildup in addition to scratches, be sure you remove the wax buildup from your furniture before trying to fix the scratch. Very light scratches are those you can see with your eye but, when you run a finger across it, you don’t feel them. These just need a little cosmetic fixing which is, fortunately, very easy to do. For light wood: Rubbing the meat of a nut along the scratch will work as the oil from the nut darkens the wood and makes the scratch disappear. Walnut and pecan both work to hide wood scratches. Once you’ve rubbed the nut along the scratch several times, run your fingertip along it so the heat of your skin can help the nut’s oil sink into the wood. For dark wood: Use the same process described above but with coffee grounds. For mahogany or cherry wood: Use iodine and a cotton swab. For ebony-finished wood: Combine fireplace ash with a little water to make a paste and rub this with your finger into the scratch. If you can feel the scratch when you run your finger over it, you’ll need something that both colors and fills. Chances are you’ve already got the right tool in your child’s Crayon box: just find a color that matches your furniture and rub it well into the scratch. Remove any excess Crayon with the edge of a credit card and polish your furniture to give it a glossy shine. Rather not use a Crayon? There are blendable scratch repair sticks that do the trick, too. 2. Place it over the dent. 3. Run a hot iron continuously over the spot for 30 seconds, move the cloth to a new damp place, and do it again. 4. If the dent remains, wait 24 hours then repeat. 5. Let the surface dry another 24 hours then rub it with olive oil or an oil-based furniture polish to remove any haze. The first time I did this, it didn’t work, but before I went to the hardware store I decided to give it another try. The second one did it, and the only reason I can think why it worked is that waiting overnight let the wood grain loosen and expand. If this method doesn’t work for you then you’ll want to pick up a tube of wood filler and follow the manufacturer’s directions. Sorry to hear that. Different methods work on different wood.